Easter is such a glorious event, we celebrate it for 50 days - from EasterSunday to Pentecost Sunday. 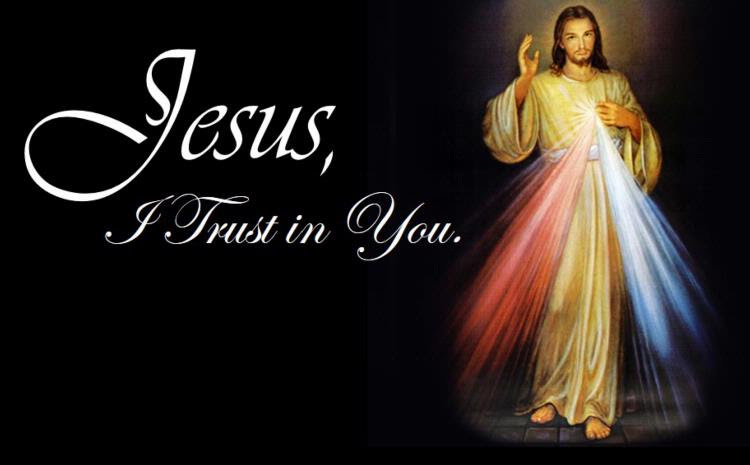 This is the Second Sunday of Easter or Divine Mercy Sunday. It is a feast enacted at the request of Our Lord himself through his revelations to St. Faustina Kowalska. During this Easter season, all of our first readings are taken from the Acts of the Apostles and most of our Gospel readings are taken from the Gospel of John. It is a special time when we learn about the early life of the Church and who Jesus truly is as he revealed himself to his disciples. It is a time when we should pay especially close attention to the readings and prayers at Mass. In our first reading (Acts of the Apostles 4:32-35), we hear how the early Church came together as one community, working, praying and breaking bread together. They shared their resources and took care of one another. The community of believers was of one heart and mind, and no one claimed that any of his possessions was his own, but they had everything in common. With great power the apostles bore witness to the resurrection of the Lord Jesus, and great favor was accorded them all. There was no needy person among them, for those who owned property or houses would sell them, bring the proceeds of the sale, and put them at the feet of the apostles, and they were distributed to each according to need. Our Gospel reading (John 20:19-31) has two distinct messages. One is the institution of the Sacrament of Reconciliation. Jesus appeared to his disciples in the locked room and gave them his peace and the power to forgive sins. The other message is a call to faith, which, by its very nature, is a belief in someone or something we have not seen but know to exist. It is the story of Thomas the doubter, who demands to touch the wounds of Jesus before he will believe that Jesus is risen. Thomas, called Didymus, one of the Twelve, was not with them when Jesus came. So the other disciples said to him, "We have seen the Lord." But he said to them, "Unless I see the mark of the nails in his hands and put my finger into the nailmarks and put my hand into his side, I will not believe." Now a week later his disciples were again inside and Thomas was with them. Jesus came, although the doors were locked, and stood in their midst and said, "Peace be with you." Then he said to Thomas, "Put your finger here and see my hands, and bring your hand and put it into my side, and do not be unbelieving, but believe." Thomas answered and said to him, "My Lord and my God!" Jesus said to him, "Have you come to believe because you have seen me? Blessed are those who have not seen and have believed." Now Jesus did many other signs in the presence of his disciples that are not written in this book. But these are written that you may come to believe that Jesus is the Christ, the Son of God, and that through this belief you may have life in his name. In our Epistle reading from the First Letter of St. John (1 John 5:1-6), we are reminded of the oneness of being that Jesus has with the Father and the special relationship we have with the Father when we believe in Jesus. We who believe that Jesus is the Son of God can conquer the world. Beloved: Everyone who believes that Jesus is the Christ is begotten by God, and everyone who loves the Father loves also the one begotten by him. In this way we know that we love the children of God when we love God and obey his commandments. For the love of God is this, that we keep his commandments. And his commandments are not burdensome, for whoever is begotten by God conquers the world. And the victory that conquers the world is our faith. Who indeed is the victor over the world but the one who believes that Jesus is the Son of God? This is the one who came through water and blood, Jesus Christ, not by water alone, but by water and blood. The Spirit is the one that testifies, and the Spirit is truth. Our readings today urge us to have faith in this Jesus, the crucified, who rose from the dead, thus atoning for our sins and conquering death. With this faith comes the peace of complete trust in Jesus and the ability to show mercy to others. Whenever we show mercy, we show God. Faith is the bird who feels the light and sings when the dawn is still dark.